TOYOTA Racing won a thrilling Six Hours of Fuji from pole position to delight its home fans in Japan and secure a second victory in its debut FIA World Endurance Championship season. The #7 TS030 HYBRID had been quickest in all but one of the official sessions prior to the race and drivers Alex Wurz, Nicolas Lapierre and Kazuki Nakajima set the standard again in the race, setting the fastest lap in the process. 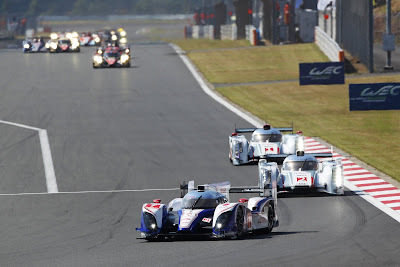 Victory by 11.223secs gave Kazuki the honour of becoming the first Japanese winner of an FIA world championship race since 1992, when Hitoshi Ogawa won a World Sportscar Championship race in the TOYOTA TS010 at Monza. It is TOYOTA’s third win in world championship endurance racing, following that Monza win and victory in Sao Paulo earlier this season. An exciting race with the #1 Audi was only settled in TOYOTA Racing’s favour late in the race, giving an emotional win just a few kilometres from Higashi-Fuji Technical Centre, where the TOYOTA HYBRID System - Racing is developed. TOYOTA led from the start with Alex, on the team’s second pole position of the season, holding the advantage through turn one. Using the 300hp boost from the TOYOTA HYBRID System - Racing, he set about pulling away from the pack. A close fight with the #1 Audi ensued through the first pit stops and driver changes. Nicolas took the wheel in the lead but at the two-hour mark the #7 TS030 HYBRID ran wide in traffic and dropped to second. Taking a second stint on the same tyres gave Nicolas the lead as part of an exciting battle and he handed over to Kazuki through to the half-distance point. A safety car period soon after created a clear track ahead and Kazuki took advantage in style by clocking a series of fastest laps. He kept up a blistering pace to stay in the fight for victory and completed a mammoth triple stint of almost three hours, maintaining his impressive speed to take the chequered flag in first place. The drivers were joined on the winners’ podium by Takeshi Uchiyamada, Vice Chairman of TOYOTA Motor Corporation, hybrid pioneer and the man responsible for the TOYOTA Prius. 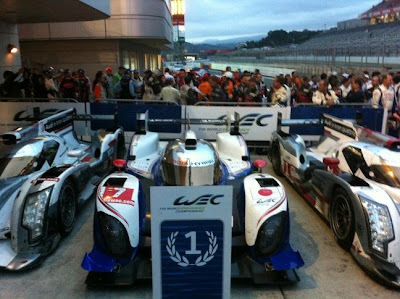 The eighth and final round of the FIA World Endurance Championship takes place at the Shanghai International Circuit in China on 28 October. Alex and Nicolas will drive the #7 TS030 HYBRID, with Kazuki competing in a Super GT race at Motegi.